Shinbashi Tamakiya opened its doors for business in 1782 away from central Edo in what is now the Shinbashi district of modern Tokyo. We are well into our third century of offering quality products that preserve and keep alive traditional Japanese flavors. Our founder was born in the village of Tamaki in Echigo. He moved to Edo and began making and selling his own original style of “zazenmame”–sweet black soy beans–which became quite a success, and he named his store Tamakiya after his home village. Our third generation owner became interested in the method of preserving food employed by fishermen in the Tsukuda-jima area. From this he developed his own techniques for boiling down certain plant and sea foods to produce his own uniquely flavored “tsukudani”, which has now been a tradition for over 200 years. 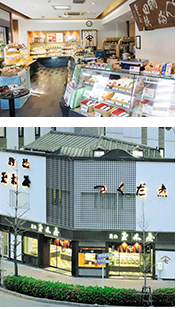 Tamakiya constantly endeavors to keep its customers satisfied by producing the finest sweet beans and tsukudani using traditional methods and only the very freshest materials gathered from the mountains and sea to create a full, rich flavor.